Home ADVICE BUILDING OR RENOVATING Is a marble splashback a good idea? 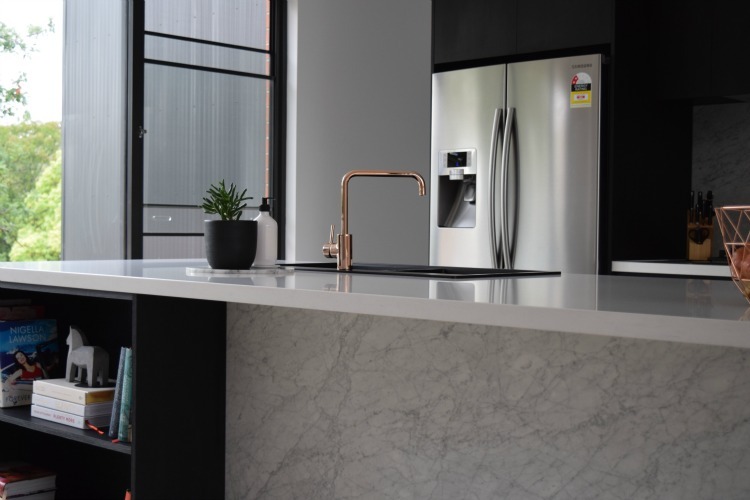 This week I got an email from a lovely reader asking about my kitchen splashback — is marble hard to maintain, does it stain easily and any other feedback I have on using marble in the kitchen. For those of you who followed my home build, you’d remember that deciding on benchtops and splashbacks was a nightmare. 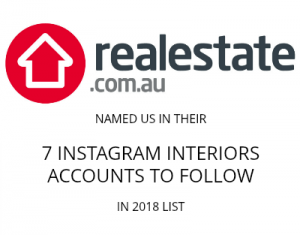 I had my heart set on marble benchtops but when all I heard was horror story after horror story about staining, chipping etc, I started looking for other options. 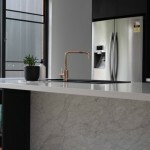 That’s when I stumbled across a stylish kitchen Greg Natale designed that used a quartz benchtop and marble splashback. I loved it immediately and knew a similar approach would work in my home. Instead of a quartz benchtop though, we opted for ‘Organic White’ by Caesarstone. It’s a slightly more expensive product but our kitchen designer said it will appear white without being so bright that every finger mark or bread crumb will stand out. He was right and I love the combo! 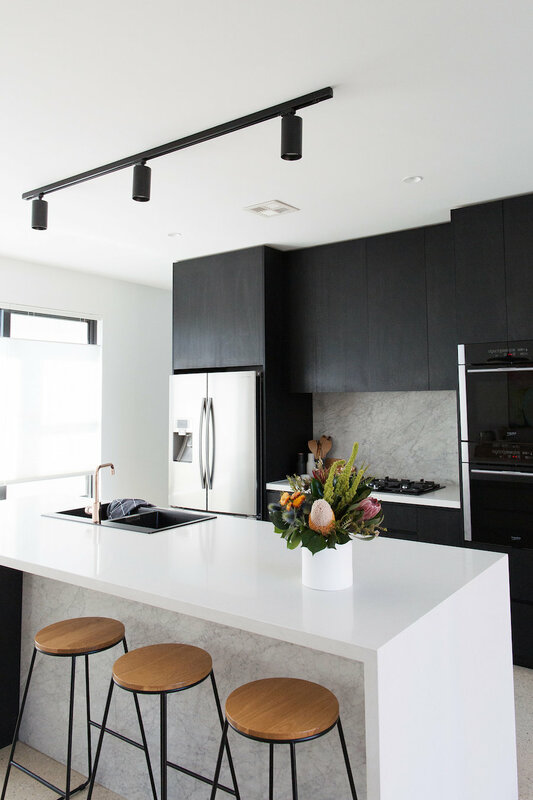 So onto the real question of this post — is a marble splashback a good idea? I say, yes, Yes, YES! The marble is right behind our cooktop and is constantly getting splattered with tomato sauce, wine, oil — my husband is Italian after all — and there’s not a stain in sight. We sealed the stone with a high quality natural stone sealer (applied two coats) when we moved in and now we just wipe it down with a damp cloth to clean. It’s that easy. I think a marble splashback is a happy compromise between wanting to use natural marble in the kitchen without being too fearful to use the space (there’s no point in having a designer kitchen if you can’t use it!). We also used marble on the island kick to bring more of the material into the kitchen. Of course, there are also plenty of faux marble options out there — Caesarstone and Silestone have a huge range or you can always use a large format porcelain tile with marble pattern for a more affordable option. 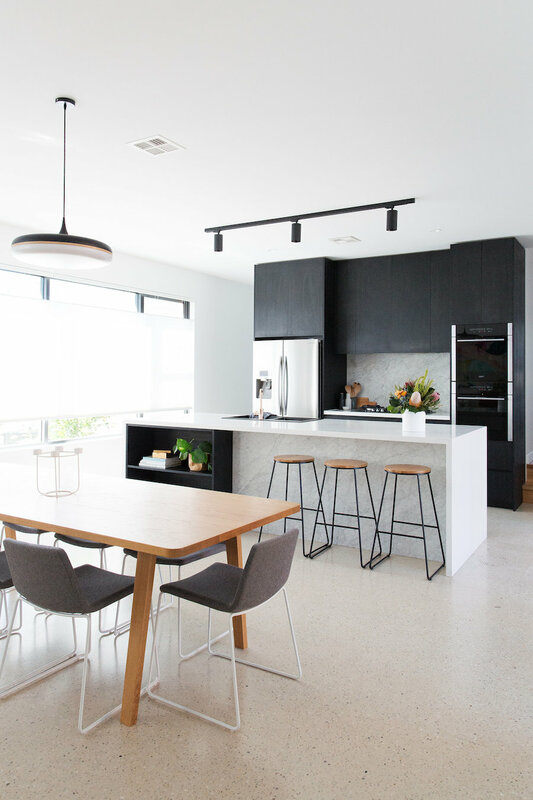 I couldn’t be happier with our kitchen and thought it was worth sharing a positive story about marble in the kitchen because when I did my research, it was mainly negative and I nearly got scared off using marble altogether! Previous articleGet organising and join our February #KonMari #stylecuratorchallenge with The Reject Shop! I have recently had a new laundry installed. Using Laminex Catalana Marble diamond gloss as the benchtop and parchment on doors. I have a black vinyl parquet floor… I never thought it would be so hard to decide on splashback but … it is. What would you suggest? This is really helpful. Having used it on your splash back would you also consider getting a bench top out of it? I’m about to re-do my kitchen and have always loved the marble bench top look. It’s always great to get feedback from real life situations. Another quick question about the cabinetry colour. I love the black but have heard people remarking on fingerprints etc. How do you find yours?